This page contains a single entry from the blog posted on August 28, 2007 4:03 PM. You may have noticed that things have been pretty quiet around here of late. We have been enjoying the summer and the cool river breezes here on the west end of Long Island, and getting ready to pick things up for the Autumn. In the next few days we will try to catch you up the local preservation and development news you might have missed. In the meantime, though, we will leave you with these images of the recently renovated former Bedford Avenue Theatre. 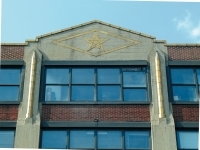 Located on South 6th, just west of Bedford Avenue, this building was graced with a peeling coat of yellow paint - picturesque in its own right, but nothing compared to the beautiful facade that has been uncovered. 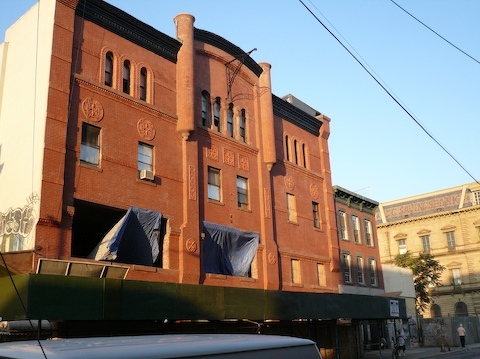 As we understand it, the building has been leased by Maxim, which operates a health club on Driggs between North 9th and North 10th (in a converted loft building). The Maxxim folks have done a great job in reclaiming this faded beauty. The window openings at the second story are unfortunate, but the rest of the work is a great addition to the neighborhood. 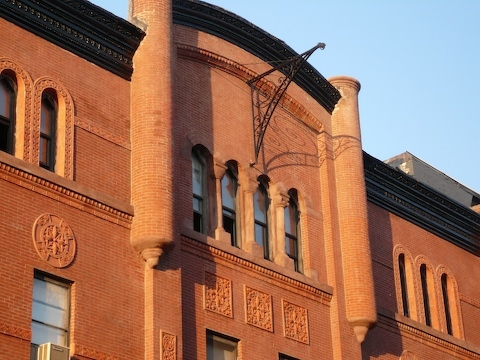 The Bedford Avenue Theatre was constructed in 1891 by builder W. W. Cole (the architect is not known). Its inaugural performance featured the actress Fanny Rice in A Jolly Surprise. The theatre's tenure as a theatre was cut short - literally - by the construction of the Williamsburg Bridge. The right of way for the bridge, which was opened in 1903, cut off the back half of the theatre, stage and all. The building is listed in the AIA Guide as the Fruitcrest Corporation building, after its most recent industrial tenant.